Houston, we have a problem! My camera lens has died on me and will no longer auto focus. This predicament makes photographing a challenge, especially when photographing arm swatches or my manicures. The lens costs a nice chunk of change, so I'll have to work with the manual focus until I purchase a new lens. Therefore, I apologize in advance for any slightly blurred or out of focus shots. In person, Midori is a tad deeper and the gold shimmers are more prominent. Midori (meaning green in Japanese) is a glorious, bright, yellow-toned grass green loaded with gold shimmer. The polish is opaque in two coats, however, I prefer the finished look after a third coat. I own a few Zoya polishes, and I really enjoy the ones I have. The formula has that "just right" consistency, and applies easily. Also, they wear very well, about five days before the first chip. I'm not sure why I don't have more Zoya polishes in my collection...I'll need to remedy that soon. 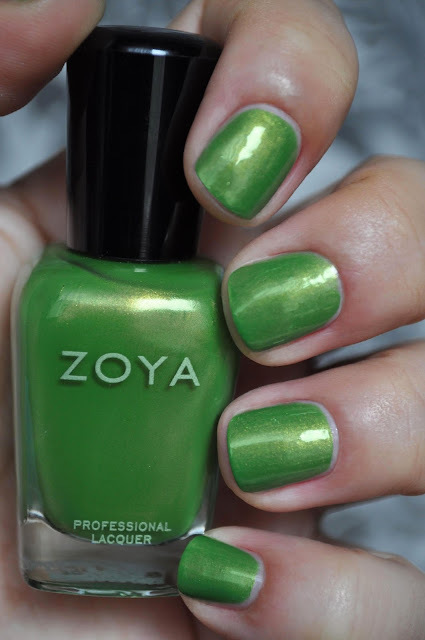 If you love green polishes, then you need this gorgeous polish in your life! What Zoya polishes do you recommend?